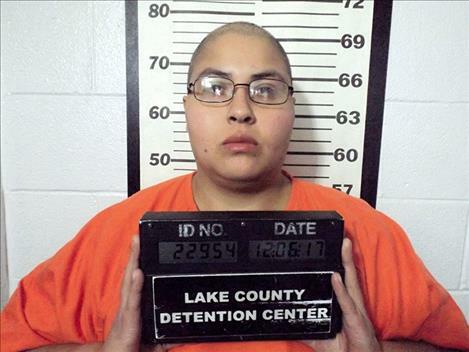 Roishell Elizabeth St. Dennis, 28, of Missoula, was sentenced at District Court in Polson on May 2 to 20 years in the Montana State Women’s Prison with 10 years suspended on an assault with a weapon charge. The charge stems from a pursuit with law enforcement that began in Missoula and ended in Lake County. According to court records, on Dec. 6, 2017, St. Dennis and 34-year-old Alta Collette Littelight of Hardin were allegedly involved in a robbery and were fleeing the scene when authorities in Missoula began their pursuit. The pursuit was ended for safety reasons when the suspects’ vehicle traveled northbound onto U.S. Hwy. 93. A description of the suspects’ vehicle was forwarded onto law enforcement in Lake County along with Flathead Tribal Police and an attempt to locate the suspects’ vehicle was issued. A Flathead Tribal Police officer spotted the vehicle passing other motorists in a no-passing zone and re-initiated the pursuit – reaching speeds of up to 90 miles per hour over Ravalli hill. The suspects then traveled onto back roads north of St. Ignatius where they displayed a firearm, pointing it at a responding officer. Littelight resolved her charge with a similar plea agreement April 4 that also calls for 20 years in prison with 10 years suspended. Judge James Manley set her sentencing hearing for May 16.